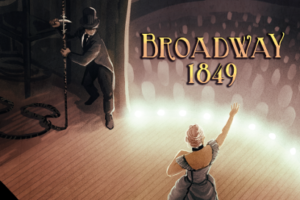 Broadway: 1849 — Fight your way to box office glory in old New York! We’re proud to announce that Broadway: 1849, the latest in our popular “Choice of Games” line of multiple-choice interactive-fiction games, is now available for Steam, iOS, and Android. It’s 25% off until November 29th! Fight your way to box office glory, while fending off the gangs of New York! Manage a theatre in a game of high-stakes business, dangerous romance, and risky alliances set in the rough-and-tumble world of 19th century New York. You’ll brave riots, fires, and political spies as you take on a city of jealous rivals, brilliant artists, and stalwart politicians. Broadway: 1849 is a 150,000-word interactive historical adventure novel by Robert Davis. It’s entirely text-based, without graphics or sound effects, and fueled by the vast, unstoppable power of your imagination. Will you succeed by your smart business sense or enlist the city’s gangs to push your competition out of business? Can you manage the diva personalities of your actors? What about a ghost haunting your theatre’s stage? Are you a flashy producer playing to please the crowd with circus acts? Do you try to earn the respect of the city’s leaders with fine art? Can you wrangle the press into writing the best reviews? • Compete with rivals to stage the biggest shows and gain the largest audience! • Choose a cast from the city’s brightest talent. • Investigate the hidden secrets of your theatre. • Rush to defuse a deadly bomb, or let it explode and plunge the city into chaos. • Nurture young talent or feed your own ambition for the spotlight. • Rub shoulders with the city’s most notorious criminals, or bring their misdeeds to light. • Help a deserving friend escape the clutches of an unscrupulous businessman. • Join forces with a criminal gang or side with the mayor’s push for order. When forced to choose you’ll decide whether to fight for peace or let the city burn. We hope you enjoy playing Broadway: 1849. We encourage you to tell your friends about it, and recommend the game on StumbleUpon, Facebook, Twitter, and other sites. Don’t forget: our initial download rate determines our ranking on the App Store. The more times you download in the first week, the better our games will rank. Probably the best game I’ve played so far of this genre.